Market forecasting is an attempt to predict opportunities for revenue generation through understanding future trends. The paper by Pilinkienų (2008) discusses a number of forecasting mistakes organizations make. Understanding how to forecast properly is part of market analysis and is a strong method for determining present actions that will have outcomes that are more fruitful in the future. Strategic decisions of organizations often rely on information contained within the present and the likely outcome of actions five or ten years down the road. -forecasting tools are used to make predictions. Forecasting the market demand is a process that seeks to analyze the present status of market demand and to predict changes in the market for a specified period of time. Such predictions help organizations adjust their strategies and offerings in a way that help them overcome environmental factors and draw the most potential for revenue. Every product and service has a lead-time and understanding trends will help ensure resources are not wasted in the developmental process. 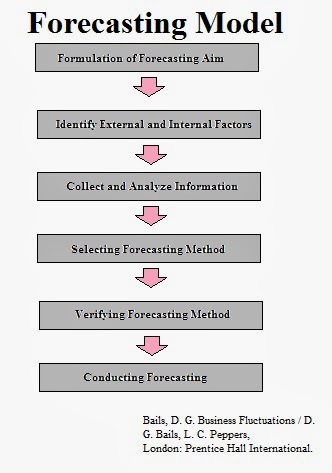 -Formulation of the forecasting claim. -Identification of external and internal factors. -Collection and analysis of information. -Verification of the forecasting method. The authors indicate that looking at market indexes and government information make the process of forecasting easier. The use of available market data is used as an overall guide to specific product/service forecasts. The more information governments and other institutions offer the easier it is to find strategic pathway to developing sustainable operations. There is bottom-up forecasting and top-down forecasting. In bottom-up forecasting the individual sales revenue of each of a firm’s products are used to determine the revenue projections of the firm. In a top-down forecasting, the highest-level sales projections are used for main products and the analysis moves downward into smaller product areas. It provides two slightly different projections. The authors found that a majority of firms use surveys in their forecasting method. They also leave far too little information on influence of external market factors (i.e. global trends). There are times when a single forecasting model can create improper market assumptions. These firms may fail to consider alternative sources of information or counter perspectives. Once completed, the firms may not assess the appropriateness and accuracy of their chosen methods thereby perpetuating the problem. In agreement with the author, the forecasting method is limited by the analytical abilities of the researcher as well as the models they chose. Where there is no perfect model available, the use of multiple models will develop increasingly accurate assessments. Firms should consider alternative scenarios in order to help themselves prepare for market changes or previous inaccurate assessments. Using a wider macro-assessment of global trends within their analysis will help ensure that the global market is accurately reflected. All local trends exist within a wider global trend. Bails, D. & Peppers, L. (1993). Business Fluctuations. London: Prentice Hall International. Pilinkienu, V. (2008).Market demand forecasting models their elements in the context of competitive market. Engineering Economics, 60 (5).